BONUSES: Behind-the-scenes footage, deleted scene. Has enough time gone by on planet Earth that the 90’s Britpop scene is warmly regarded as a piece of musical history worthy of our attention? Apparently it is, because Marshall Lewy’s (Blue State) new independent feature, California Solo, uses it as the backdrop for an engaging drama about a man escaping from his musical demons by hiding in the fields of an organic farm. 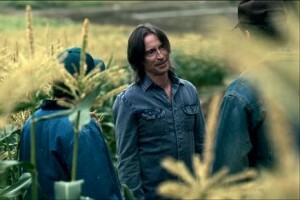 Robert Carlyle (TV’s Once Upon A Time, Trainspotting) is one of those actors who’s presence always makes a movie that much better; he first caught my attention in Ken Loach’s wonderful working-class comedy Riff Raff, and his best work remains with films that favor character over plot, life’s small details over its big ones. Robert Carlyle gets organic in California Solo. California Solo follows this tradition, tapping into the soul of 70’s American Cinema as Carlyle plays Lachlan, the ex-guitarist of a 90’s alternative band who’s Kurt Cobain-esque brother used to lead, until too many drugs ended his life. But he got off easy; it’s Lachlan that’s stuck with the hangover, and he deals with it by turning his back on his former fame and becoming a farmer, selling tomatoes on weekends to young hipsters outside of L.A. One of these hipsters is (predictably) an attractive struggling actress named Beau (Alexia Rasmussen, Our Idiot Brother) who takes a liking to Lachlan, though the film thankfully bypasses the predictable romance in service of a more realistic storyline. Up until now, Lachlan’s M.O. was farm by day, get trashed by night- but a D.U.I. threatens to send him back to Scotland, which he desperately tries to avoid via the help of a couple of well-meaning lawyers. The film deftly entwines social commentary about our messed-up immigration system with an unassuming slice of naturalism, and it’s all held together by some wonderful performances between Carlyle and his comrades: Rasmussen gives her struggling actor a genuine personality; A Martinez (Santa Barbara) is Lachlan’s Mexican-American boss always one step away from giving up on him; Kathleen Wilhoite (TV’s ER) is the mother of his child, who tries to help him out even though she knows he’s a lost cause; and Savannah Lathem (TV’s Lost) does a wonderful job as Lachlan’s estranged 12-year-old daughter who’s sweet innocence gives him a reason to start living. Memo Salazar attempts many things and accomplishes few. His big three are making films, music, and comics, but he'll throw photography, graphic design and film criticism into the ring for good measure. He'll even make you a hand-painted t-shirt if you ask nicely. You can track his activity here when there's nothing else to do at work.